Counting Crows got together for this concert to perform their debut album beginning to end. It’s a great live recording. I reviewed the BluRay of this in the last issue, so this one will focus more on just the audio and the break down of the individual songs. It’s a safe bet that Counting Crows fans will love this set. The alternative rock sounds of this cut work very well in this live telling. It’s a real singer songwriter type of song, but with the addition of some minor progressive rock elements and hard pop rock. This is a shorter song, and more of a song than the spoken sort of elements of the opener. It’s a good track. 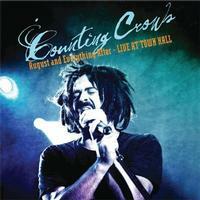 One of Counting Crows’ biggest hits, this one was great in the studio and it’s great live, too. It rocks out a bit more than the previous number, but doesn’t lose any of the charm. I particularly like the guitar presence here. This is just a short spoken word bit. A track that’s more ballad-like, there’s a lot of charm built into this one. The retro sounding keyboards are great, too. Some cool instrumental work opens this one up in fine fashion. As it moves into the song proper, it’s a potent tune that works well based on both the vocal and instrumental performances. There’s definitely an air of country music on this tune. It’s got some retro keyboard work on it, too. It’s another cool one. Much more of a straight forward alternative pop rock number, this is catchy and cool. The melodic classic rock styled guitar solo on this piece is particularly nice. At times this reminds me a little of Bruce Springsteen. Here’s an extended spoken word introduction explaining the story behind the song to follow. As this track starts, there’s a killer slide guitar solo. The cut evolves into more standard Counting Crows styled rock. It’s a good number that works pretty well here. Coming in hard edged and bluesy, this is a killer tune and one of my favorites on the whole set. Another that’s starts off quite hard rocking, this works out to something much in line with the rest of the album. It’s a killer tune, though.